This past Friday, a friend of mine invited me to a dinner party hosted by his friend who is a chef. The only thing I knew going into the night was that there was going to be a group of about 12 of us and that we would be going to the chef’s apartment. Israeli chefs Omer Amir and Matan Shalev. When I arrived at what I assumed was someone’s apartment, I quickly realized this was not the Friday night dinner I had expected. When I walked in, I saw a large island that sat about 15 people set up with plates, cups, and silverware, in a fashion that you would typically see at a restaurant. Behind the island was a small kitchen with a large stove, oven, and refrigerator. So, you could imagine my surprise when I realized I wasn’t at a chef’s apartment– it was a private dining room. Music played and people socialized around the room, with others out on the porch. Once everyone sat down, the two chefs introduced themselves and gave a brief explanation of where we were and what we should be expecting for the night. 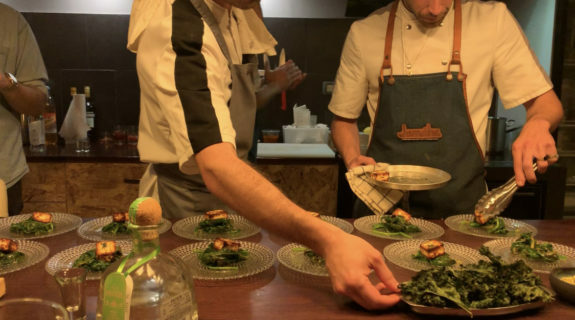 Jamaha Tel Aviv is a private dining experience run by Israeli chefs Omer Amir and Matan Shalev. The two have been long-time friends who once worked at the same restaurant together until they decided to create a culinary experience like no other. The two native Israelis use recipes that were taught to them by their grandmothers and mothers throughout the years. 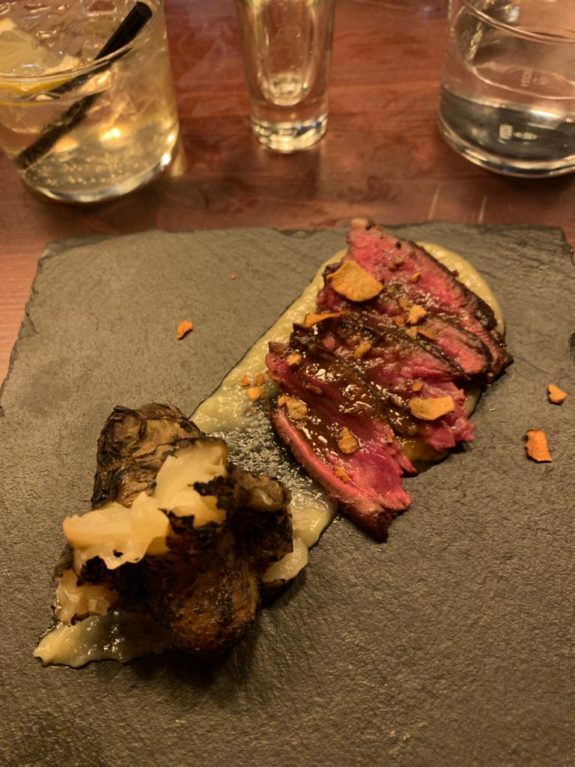 They utilize the techniques they have learned from their past experiences working at prestigious restaurants to make some of the most incredible food I’ve had in Israel. The best part of it all is that Omer and Matan live in an apartment right above the dining room. The night started out with a brief introduction from the chefs followed by about seven courses of food. 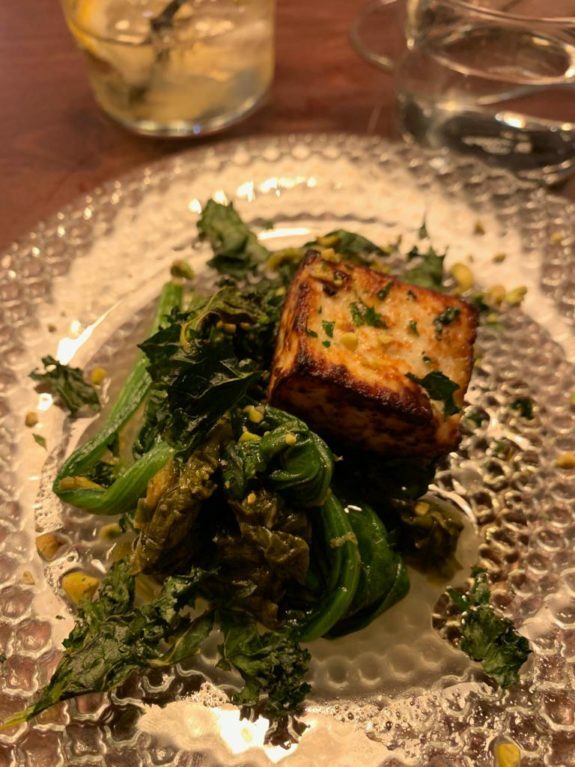 Each of the ingredients used throughout the night came from different Kibbutzim, collective communities in Israel that are traditionally based on agriculture, so each dish was exceptionally fresh. Their cuisine is a blend between Israeli, Syrian, Persian, Moroccan and Asian food, which created an explosion of taste in my mouth. Some of my favorite dishes that they served were the salmon with wild mushrooms, raw beef tartare, and grilled ricotta on a bed of sautéed spinach, kale, and chard. The food was extremely flavorful and their presentations were very instagrammable. Grilled ricotta on sautéed spinach, kale, and chard. They didn’t just prepare and serve us food. They were dancing and singing while doing it, which hyped all of us up. They weren’t afraid to have fun with us and be a part of the group which put the whole experience over the top. Between each course, everyone would step outside for some fresh air and chatter, as well as a lot of dancing inside with the chefs, of course. Omer and Matan really made everyone feel like they were at home. We could change the music from their computers as they pleased, pour ourselves drinks, and roam around and explore their little restaurant. The atmosphere was intoxicating and the chefs really knew how to interact with all of us. What made the night so special was to see two young men who really love what they do have fun while doing it. 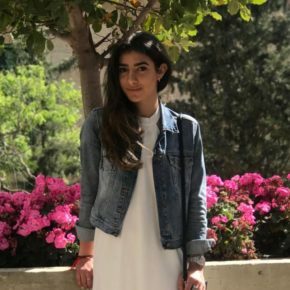 Kayla Youssian is a junior at Boston University studying advertising with a focus in religion. This semester she is studying abroad in Herzliya, Israel. There, she hopes to explore Israel and learn more about the culture and its history. In her free time, she enjoys listening to music, making jewelry, and taking lots of photos and videos.